New @UofTengineering students gathered for @Skule_Froshweek #FWeek1T2 Orientation. 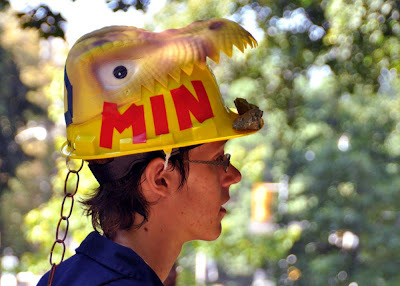 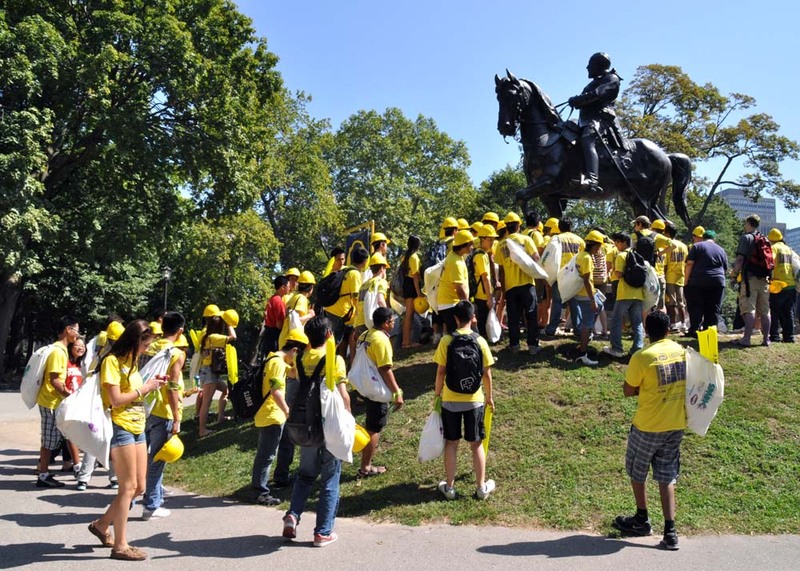 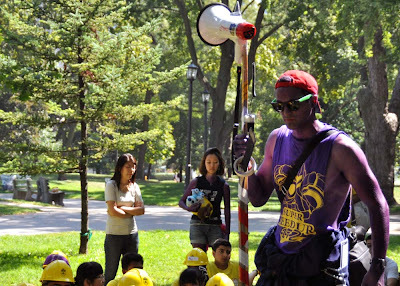 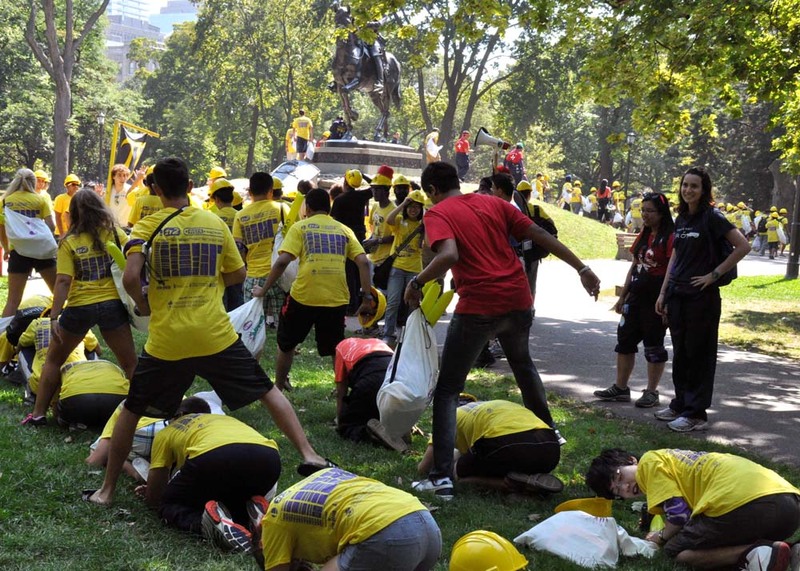 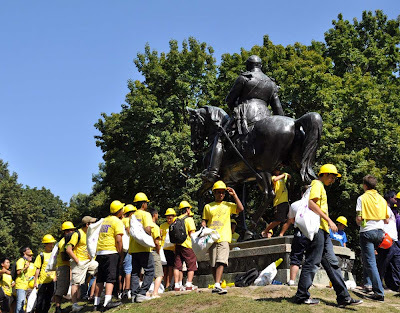 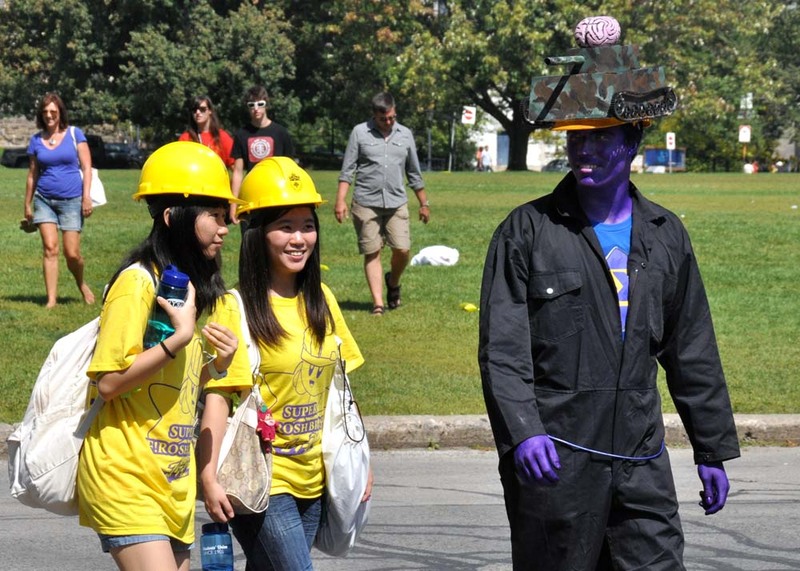 Making their way through campus and Queen's Park wearing bright yellow shirts and construction hard hats they eventually ended up dyed purple and wandering through downtown Toronto on Monday September 3, 2012. 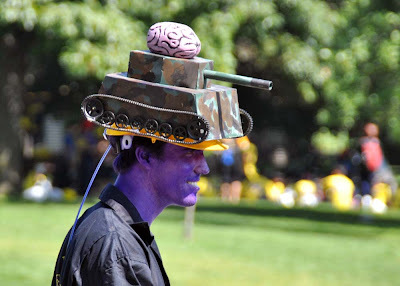 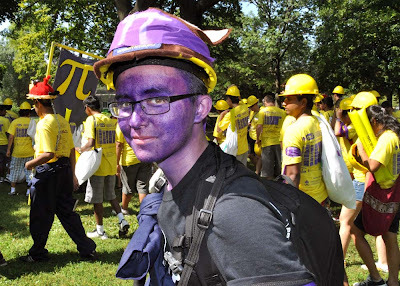 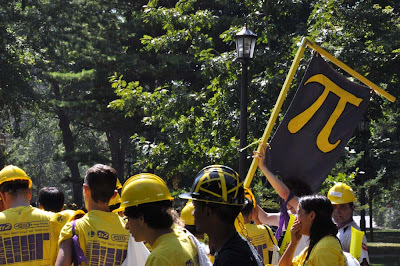 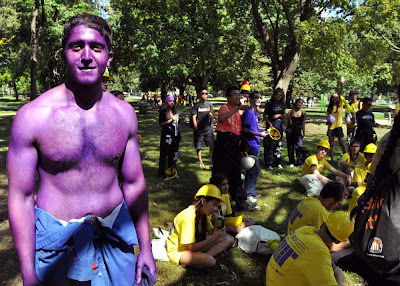 Volunteers from other academic years were on hand, and already purple, to help guide the new members of the engineering community. 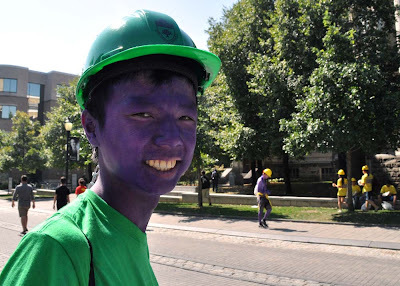 Each group passed through several stations learning engineering chants and some engineering lore before they entered a tight alley and jumped into a hot tub full of medical dye. 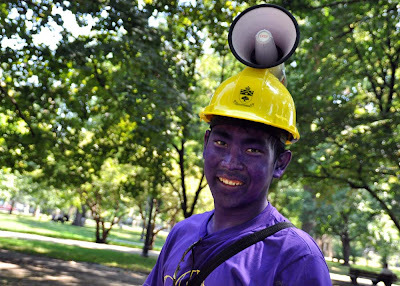 A quick dunk or two later and they were very smurfy and ready for the walk. Approximately 1,000 fresh frosh students went through the years long process to transition from young student to an iron-ringed engineer in a ceremony that many schools follow, some with their own particular twists. 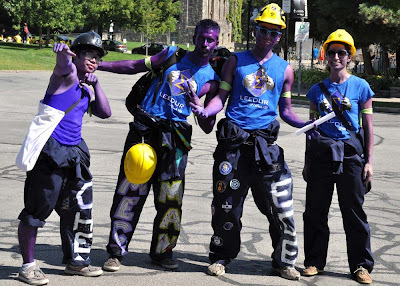 The original rings were said to be forged from a bridge that collapsed, reminding them of the importance of their designs and calculations, the purple dye from the Titanic engineers in purple uniforms that remained on board shoveling coal to keep the ship afloat as long as possible. The dye they use can last a day or two and multiple baths will leave you purple for a week. They also kiss the horse in the Edward VII statue in the middle of Queen's Park for luck. 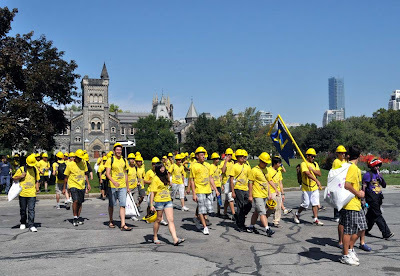 See more Skule Orientation after the jump.